Ohio Gov. John Kasich's comments that Obamacare won't be repealed even if Republicans take the Senate were a major departure from most members of his party. Washington (CNN) -- A repeal of President Barack Obama's signature health care law is "not gonna happen" even if the GOP takes the Senate, Ohio Gov. John Kasich said. The Republican governor's comments, in an interview with The Associated Press published Monday, are a major departure from the rest of his party -- and stunning for a potential 2016 presidential contender. 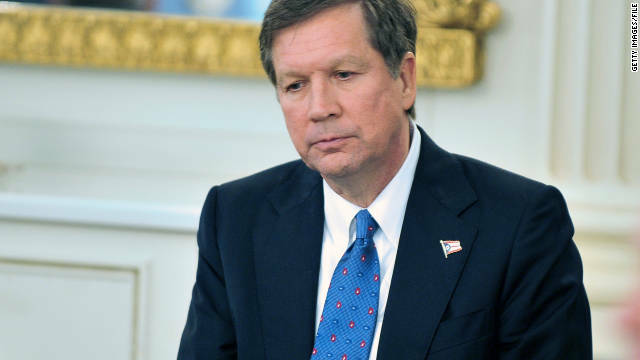 "The opposition to it was really either political or ideological," Kasich said of Obamacare. "I don't think that holds water against real flesh and blood, and real improvements in people's lives." The governor later reversed course on Twitter, saying The Associated Press "got it wrong" and that he wants to "repeal and replace" Obamacare. A Kasich spokesman said the governor was referring solely to Obamacare's Medicaid expansion -- not the entire law -- and that his comments were reported out of context. The AP got it wrong. Ohio said NO to the Obamacare exchange for a reason. As always, my position is that we need to repeal and replace. Kasich angered conservatives when he bypassed Ohio's Republican-controlled legislature and embraced Obamacare's Medicaid expansion last year. His comments reflect the political balancing act facing GOP governors who criticized the law but have implemented parts or all of it. Indiana Gov. Mike Pence has sought a middle ground, arguing for a version of the Medicaid expansion that includes changes such as individual health savings accounts requiring personal contributions -- a program initially crafted under his predecessor, Mitch Daniels. Others Republican governors seen as prospective presidential candidates, like Wisconsin's Scott Walker and Louisiana's Bobby Jindal, have been outspoken opponents of Obamacare, refusing to implement it and saying they'd like to see it repealed. In states that have expanded Medicaid, Democratic Senate candidates like Alison Lundergan Grimes in Kentucky have pressed their Republican opponents about what would happen to the hundreds of thousands of low-income residents who now have health coverage. "We have over a half a million Kentuckians who for the first time ever are filling prescriptions, they're going to the doctor, they're getting checkups," Grimes said in a recent debate with Senate Republican leader Mitch McConnell. "I will not be a senator that rips that insurance from their hands."